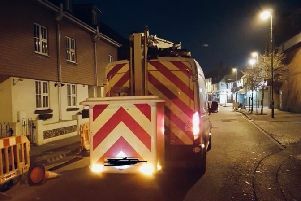 The jury in a trial of six men charged in connection with an attack on a man in Durrington have delivered their verdicts, the Crown Prosecution Service has confirmed. Tommy Howlett and Bradley Jake Allen were charged with the attempted murder of Wayne Heys in Carisbrooke Drive, Durrington, on February 20, Hove Crown Court heard. Mr Heys required emergency surgery after being attacked in a drugs dispute, the court heard during a lengthy trial. Howlett, 24, of no fixed address, and Allen, 27, of Orkney Court, Worthing, were both found not guilty of attempted murder when the jury returned its verdicts this week, the CPS said. But Howlett was convicted of blackmail, conspiracy to commit grievous bodily harm with intent, two counts of damaging property, causing grievous bodily harm with intent and having an article with a blade or point, the CPS confirmed. The CPS added Allen was convicted of blackmail, conspiracy to commit grievous bodily harm with intent and causing grievous bodily harm with intent. As well as being found not guilty of attempted murder, Allen was cleared of two counts of damaging property. Four others faced trial in connection with the incident. Joshua Bosley, 24, of Bulkington Avenue, Billy Howlett, 26, of Kingsland Close, Shoreham, and Katherine Olive, 20, of Harrow Road, West Worthing, were all convicted of conspiracy to commit grievous bodily harm with intent, the CPS said. Callum Alex-Hunt, 24, of Butts Road, Southwick, was found not guilty of conspiracy to commit grievous bodily harm with intent, said the CPS.